It has been such a pleasure to spend time with people who love words, I have learnt such a lot from all the members of the group. Being able to share ideas and the writing process, from early scratchings, through editing and then to the final piece has been enlightening. I have loved being introduced to new published authors as well and to discover a new world of short stories that I have never explored before. Using the collection of art pieces has been inspirational to me as well. I didn’t know the Sainsbury Centre before this group began but I think it will become a favourite place and may well inspire more of my writing ideas. Each week I have got to know it a little better. The Narrative Fiction course was an outstanding introduction to the art of writing. Patricia's well planned lessons and gentle guiding hand have fostered a renewed interest in the written word. Grateful thanks. I really looked forward to our weekly meetings. Patricia set a very constructive tone from the very beginning and a very good group meant that the sessions were both productive and thought provoking. I thought it was very well designed, and richly layered course. The structure was really helpful, and the teaching style was warm, supportive and very informative. There was a nice balance between encouragement and challenge, and we were all accommodated. Every session was lively, stimulating and very enjoyable, inspiring us to go off and try things on our own. I found the course enjoyable and yet at the same time quite demanding. Patricia always commented on everything we wrote and her helpful comments, ideas and criticism was invaluable. I think whether you want to just come on the course to explore whether you are able to write or if you are already a writer and want to improve your writing skills then this course would be ideal for you. since I moved here three months ago. The day began with a creative forage in the meadow and summerhouse. Surprising inspirations and interventions were collected and brought back to the studio for creative play.. Tracey Ross demonstrated unusual techniques used in her landscape and seascape paintings; these included working with plaster, linen scrim and acrylic paint and wax crayons. After a fine pot-luck lunch on the terrace, the group assembled in the conservatory where the foraged words and artefacts formed the basis of individual short fiction, with digressions into structure and writing forms. 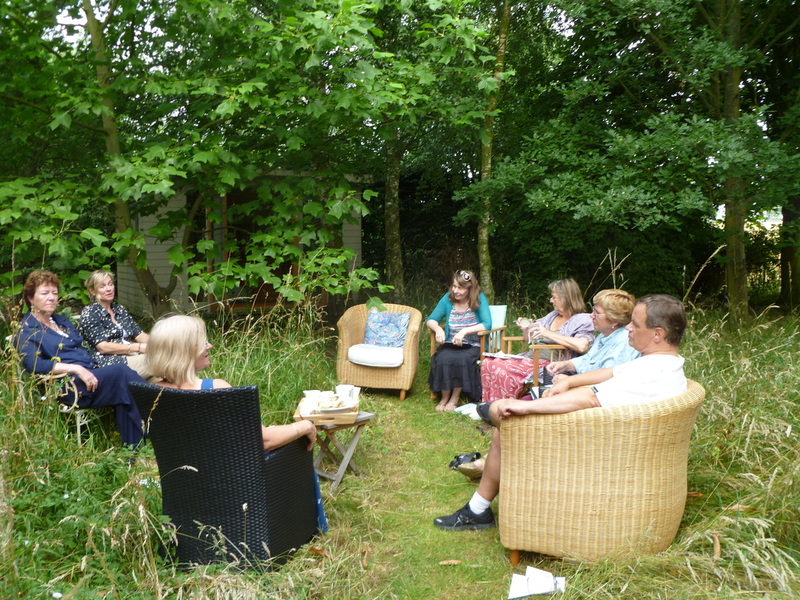 The day concluded with creative chat over tea, lemon cake and raspberry muffins in the meadow on a perfect English summers day. Bliss. Comments on the Creative Catalyst workshop. 'Patricia's skilful coaching has helped not only my writing, built my self confidence and capacity to juggle the complicated circumstances of my present situation in life. Her experience in business and life and her organisational talent are offered in a non-judgemental way combining humour and a fellow feeling for her mentee.' Molly Barratt. Amanda Radford. Creative Spring participant. Jill Napier, Community Learning Officer, Norwich Cathedral (retired). Brenda Daggers, creative writing student. Juliet Nicholls, Cathedral Open Studio art student. Claire Riviere, creative writing student. I have taught in many diverse settings, ranging from challenging inner city comprehensives in London, to Norwich Cathedral, The Sainsbury Centre for the Visual Arts, the Julian Shrine, HM Prison Norwich and a group containing organic farmers in South Norfolk. Some of my students are complete beginners, others have writing and workshop experience, a few already have a creative writing degree behind them. Students have progressed to study degree and MA courses; others have gone on to win local and national writing competitions. All have benefited from the camaraderie of the 'writing family' that develops through the close analysis of text, and support within the group. Criticism is constructive, clear and supportive. You leave the course with a writing tool kit, participants learn not only from critiques of their own writing and one another, but also from closely studying the texts of highly regarded authors. I have been fortunate to work on projects that enrich the creative lives of the vulnerable, marginalised and the excluded; and I have taught students who range in age from eleven years to ninety-two. I also have a special interest in reminiscence and the use of art, text and story in stimulating recollection, accessing memory and aiding intergenerational communication. I am passionate about writing and love teaching. The image above was created by Juliet Nicholls - Open Studio student: using the memorials on the floor of the Cathedral cloister and nave, Juliet overlaid images of text, using tracing paper, torn paper and calligraphy from a number of graves and memorials.